The following example will create a Contact Us Custom Form page on our web site. This form will contain a security CAPTCHA field and will automatically send an email to both the user who completed the form and the site administrator. Add a Custom Form under your Site, titled Contact Us. Right click on the Custom Form's Form Contents asset in the Asset Map and select the Form Contents screen. On the Form Contents screen, create a new section on the form, titled Personal Information. To do this, enter Personal Information in the Add Sections field and click Commit. A new Section asset will appear in the Asset Map, as shown in the figure above. Right click on the Personal Information Section asset in the Asset Map and select the Details screen. Add three Text type questions. To do this, in the Add Questions field, select the Text question type in the first list, 3 in the second list and click Commit. Three question assets will appear in the Asset Map and be added to the Current Questions list, as shown in the figures to the right and below. Add a Select type question. To do this, in the Add Questions field, select the Select question type in the first list, 1 in the second list and click Commit. A fourth Question asset will appear in the Asset Map and be added to the Current Questions list. Repeat these steps to add three more questions: two Numeric type questions and one Email Address type question. Once you have done this, seven Question assets will appear in the Asset Map and be listed in the Current Questions list, as shown in the figure below. Add another question to the form, outside of the Personal Information section. i) Right click on the Form Contents asset in the Asset Map and select the Form Contents screen. 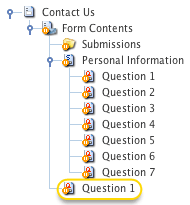 ii) In the Add Questions field, select Text in the first list, 1 in the second list and click Commit. A Question asset will appear in the Asset Map and be added to the Current Questions section, as shown in the figures to the right and below. Right click on the Question 1 (text type) asset under the Personal Information section in the Asset Map and select the Details screen. In the Title field, enter First Name. In the Maximum Length field, enter 50. This will mean that users will only be able to enter up to fifty characters in this field. In the Custom Required Error field, enter Please enter your first name. This will be displayed on the form if the user does not answer this question. Click Commit. The name of the asset in the Asset Map will change to First Name. Right click on the Question 2 (text type) asset under the Personal Information section in the Asset Map and select the Details screen. In the Title field, enter Surname. In the Custom Required Error field, enter Please enter your surname. This will be displayed on the form if the user does not answer this question. Click Commit. The name of the asset in the Asset Map will change to Surname. Right click on the Question 3 (text type) asset under the Personal Information section in the Asset Map and select the Details screen. Right click on the Question 4 (select type) asset under the Personal Information section in the Asset Map and select the Details screen. In the Title field, enter State. Click Commit. The name of the asset in the Asset Map will change to State. Right click on the Question 5 (numeric type) asset under the Personal Information section in the Asset Map and select the Details screen. Right click on the Question 6 (email address type) asset under the Personal Information section in the Asset Map and select the Details screen. In the Title field, enter Email Address. In the Custom Required Error field, enter Please enter your email address. This will be displayed on the form if the user does not answer this question. Click Commit. The name of the asset in the Asset Map will change to Email Address. Right click on the Question 7 (numeric type) asset under the Personal Information section in the Asset Map and select the Details screen. In the Title field, enter Phone Number. Click Commit. The name of the asset in the Asset Map will change to Phone Number. Right click on the Question 1 (text type) asset under the Form Contents asset in the Asset Map and select the Details screen. In the Title field, enter Comments. Click Commit. The name of the asset in the Asset Map will change to Comments. 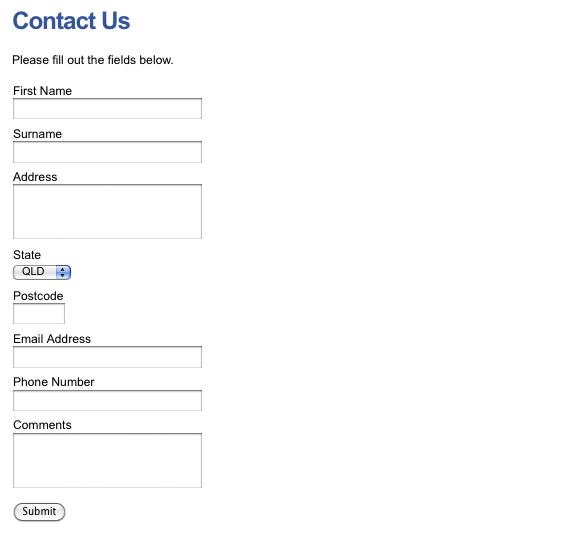 The default layout of the Contact Us form is shown in the figure below. The Comments question in this layout appears at the top of the form and there is no heading for the page. We need to change this layout to move the Comments question to the bottom of the page and add a heading, as well as include additional features. 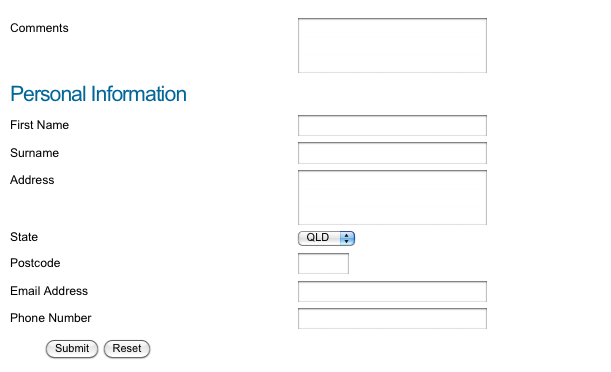 i) Right click on the Form Contents asset and select the Form Contents screen. ii) In the Use Bodycopy field, select Page Contents and click Commit. A Bodycopies Folder will appear in the Asset Map, containing the Page Contents Bodycopy, as shown in the figure to the right. Right click on the Page Contents Bodycopy and select Edit Contents. Enter the following content into the WYSIWYG Editor. The List of Submission errors keyword replacement is added to the top of the form so that errors will be displayed when the form is not completed correctly. The Submit Button is also added so that the user can submit the form. The new layout of the Contact Us is shown in the figure below. 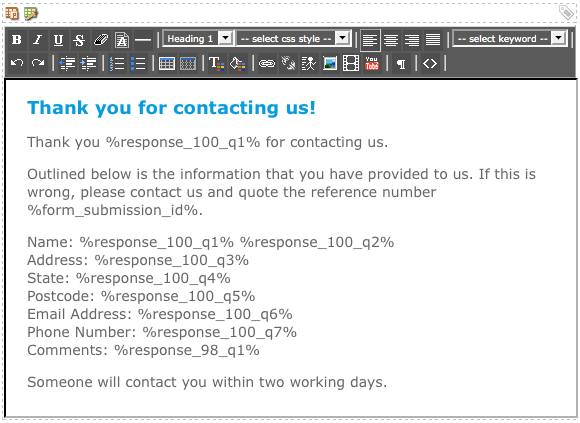 The default layout of the Thank You page on the Contact Us form is shown in the figure below. 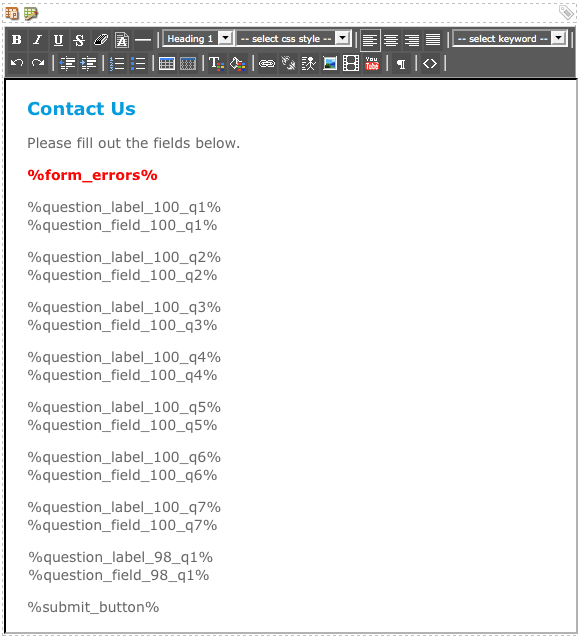 This layout is shown when the user submits the form. The Comments response in this layout appears at the top of the form and there is no heading for the page. We need to change this layout to move the Comments question to the bottom of the page and add a heading, as well as include additional features. ii) In the Use Bodycopy field, select Thank You and click Commit. The Thank You Bodycopy will be added to the Bodycopies Folder, as shown in the figure to the right. Right click on the Thank You Bodycopy and select Edit Contents. The new thank you layout of the Contact Us is shown in the figure below. Right click on the Form Contents asset in the Asset Map and select the Form Contents screen. In the Require CAPTCHA field, select Yes. In the CAPTCHA Key Length field, enter 6. This will mean that the CAPTCHA image will display six characters. In the CAPTCHA Character Zoom field, enter 3. This will mean that the CAPTCHA characters will be randomly zoomed between sizes 1 and 3. Add the CAPTCHA keyword replacement on the Page Contents Bodycopy, as shown in the figure below. The CAPTCHA field will now appear on the Contact Us form. The recipient email needs to be set up so that an email is sent to the site administrator. Right click on the Form Contents asset in the Asset Map and select Email Options. Navigate to the Recipient Email Options section of the screen. 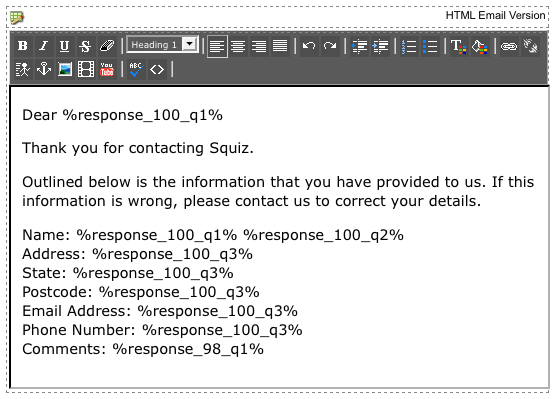 In the To field, enter the email address of the site administrator, for example admin@squiz.com.au. In the From field, enter the 'from' email address. You can use the email address form question keyword replacement in this field (e.g. %response_100_q6%). This will use the email address that the user enters on the form. 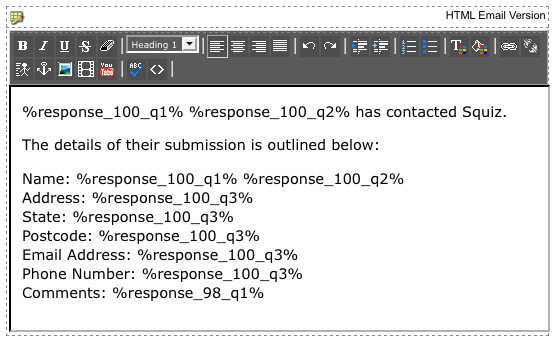 In the Subject field, enter a subject for the email, for example %response_100_q1% %response_100_q2% has contacted Squiz. In this example we are using the user's responses to the first name and surname questions in the subject of the recipient email. In the Body field, the content shown in the figure below is added to the HTML version of the email. The keyword replacements for each question can be found by clicking on the list of keywords available for use in emails hyperlink under the Keyword Replacements section on the screen. The receipt email needs to be set up so that an email is sent to the form user. Navigate to the Receipt Email Options section of the screen. In the Receipt Recipient Question field, select the Email Address question. This will send an email to the address that the user enters on the form. 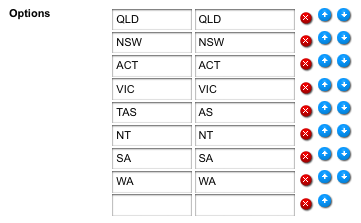 In the From field, enter the 'from' email address, for example admin@squiz.com.au. In the Subject field, enter a subject for the email, for example Thank you for contacting Squiz. The submission is logged to the database. Once you are sure the Custom Form is working correctly, change its Status to Live and grant Public Read Permission.